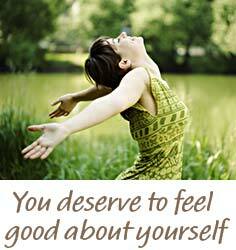 You deserve to feel good about yourself, your body, and your relationships with food and people. It hurts to constantly battle food, thoughts about food, and hatred for your body. How you EAT dramatically effects how you FEEL, and how you FEEL effects how you EAT. Food is for nutrition and enjoyment. Babies innately know how to eat; they cry when they are hungry and, stop when they are full. Carefree children, influenced by powerful, confusing and conflicting messages from media, family and friends often conclude that being thinner is better. In their quest to become thin and feel "okay" in the world and/or to cope with difficult emotions, relationships, yearnings and fears, they develop harmful eating patterns and behaviors. These self-sabotaging behaviors cause shame, distress and often serious health problems, yet, they are a byproduct of the true issues. When did you give up eating for nourishment and pleasure? When did you begin to eat for other reasons or lose the ability to stop when you are full? When did your focus on food and your weight prevent you from giving attention to other important areas of your life? I will help you get to the bottom of why these problems started, and their significance in your life today. YOU house the resources that will help you to live the life you want; together we will target and utilize your skills to their fullest potential. Dieting bandages a wound without cleaning or disinfecting it first. It is a short- term solution that often initiates a viscous cycle of problems including binge-eating and purging. In my approach, we will use a bandage by directly and actively addressing unproductive behaviors AND "clean and disinfect" by exploring underlying issues and conflicts. You will make meaningful changes in your behaviors so they work for you rather than against you. This may feel difficult at first but the results are far more rewarding and longer lasting. Some of the greatest changes you will make are not about food and weight at all yet they will affect your weight in a positive direction. Through this process, you will gain a better sense of yourself, value your worth, nourish yourself in non-food ways and focus much less on food and your weight as a result. What I ask from you is to be patient. Eating behaviors don't develop overnight, and change doesn't happen overnight. Change may take time but it will be worth your effort. And that's a guarantee! If you would like to discuss my philosophy or have any questions, contact me.